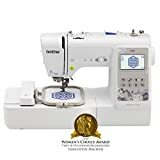 If you decided to stop by this page, you’re probably on a lookout for a sewing machine that will be able to powerfully rush through the fabrics of your choice and do some fancy, decorative needlework too. Brother SE600 is one of the most popular options currently on the market, and it will allow you to branch out and develop your craft like a pro. In 2018, it was awarded the Women’s Choice Award, with 9 out of 10 customers recommending it to others. Customers on Amazon have given it 4.3 out of 5 stars, with 77% of them claiming their experience is excellent. And it didn’t happen out of the blue. Brother is one of the most distinguished sewing machine manufacturers, renowned for decades for their excellence and innovation. Many sewists are still reluctant to replace their mechanical workhorses with computerized machines, since they don’t want to rely on software and digital systems that can easily go wrong. But times are changing, and more people are realizing how important it is to make the sewing process easier and more elegant with computerization. 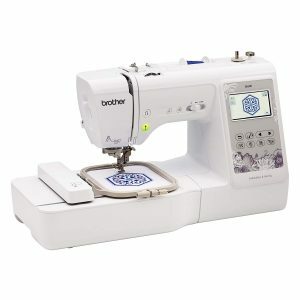 Brother SE600 is a perfect example of a machine with bells and whistles that don’t require weeks to master. So, I’m giving you an in-depth review to help you consider whether you need this machine. But before diving into the reasons why you should or shouldn’t get one, let’s make a short overview of the machine’s highlights. This Brother machine is computerized, which means it has many automatic features that are supposed to make your life a lot easier. With a large, 3.2-inch smart color LCD display, it’s easy to choose your designs and show your edits before actually making the first stitch. The 103 built-in stitches, 80 built-in embroidery designs and 6 built-in embroidery fonts are not the end of your possibilities – you can import even more designs via a USB port. So far, computer connectivity was a feature reserved for high-end machines. With this model, you don’t have to pay an arm and a leg to get an infinite number of creative possibilities. An array of decorative stitches means an extra opportunity for your craft. Choose from Greek key, decorative scrolls, waves, stars, hearts, feather, scallops, and more. As for the characters, you can also customize them by choosing from small, medium and large. Other automatic features include 4 x 4 embroidery field, start and stop sewing buttons, automatic needle threader and thread cutter, needle up/down position that enables pivoting the fabrics without losing the stitch, speed controller so you can sew at different speeds for different kinds of work, as well as drop feed if you’re into free-motion sewing. Quilters will appreciate extra room in the needle-to-arm workspace, though it’s still far from enough for larger quilting projects. Seven presser feet include spring action zigzag, buttonhole, overcasting, monogramming, zipper, blind stitch and button sewing feet. According to the product description, the machine would be able to cut through thicker fabrics thanks to the longer zigzag foot and 7-point feed dogs, so the fabrics can move through more swiftly, without bunching up. As you unbox it, you will also find a twin needle, a darning plate, 2 bobbins, 3 bobbin clips, 6-piece needle set, a screwdriver, a set of spool caps, scissors, and a cleaning brush. There is no hard protective case – just a dust cover. But then again, it wouldn’t be typical for machines within this price range. When compared to its direct predecessor Brother SE400, this beauty is much easier to handle due to the larger LCD screen which is colored, so you can see details better. They also upgraded the number and variety of built-in stitches and embroidery designs, plus SE400 didn’t have the USB port. Both models, however, have the same sewing speed of 710 stitches per minute – not enough for industrial sewists, but satisfying if you do this on a smaller scale. Their embroidery speed is 400 stitches per minute. If you often work on embroidery projects, note that you will be able to edit and manipulate the embroidery designs by positioning them and changing their colors on the touch screen, and seeing how it all looks like before making the first puncture on your fabric. Finally, in case you’re wondering about warranty – you will get 25-year limited warranty on chassis casting. Electro-mechanical parts have a 1-year warranty, whereas the electronic printed circuit boards will be guaranteed for 2 years. Newbie-friendly. Switching between sewing and embroidery is easy as pie and shouldn’t take up more than a few minutes, even if you’re only just learning – just change the foot and the base. Use the LCD screen to the most advantage: when you select your stitch, it will tell you which foot to use with it. Even customers who have never sewn before found it easy to set up and completed their first projects within days. Built-in tutorials are easily accessible on the smart screen, eliminating the guesswork during the initial setup. Of course, if you have never used a sewing machine before, there will be a learning curve. But it won’t be as steep as with most other machines. The top drop-in bobbin is jam resistant. Bobbins can be a nightmare, especially when they are loaded on the side and easily jammed. On this model, the top drop-in bobbin comes covered with a transparent case, so you can always keep an eye on thread supply and not risk unexpectedly running out of thread in the middle of a project. This bobbin technology is one of Brother’s signature features, present in all of their newer models. The stitch length and width are adjustable on the touch screen. By adjusting these parameters, you will be able to control the tightness of your seams. It will be of immense help when you work with thicker fabrics or multiple layers of thin fabrics, which are generally better off with a looser stitch. Adjustable speed control is a crucial feature for many a sewist – at least I know I couldn’t live without it. Of course, every machine has a speed controlling system in the foot pedal, but it’s often very hard to provide the exact right amount of pressure. That is why this slider is so great – it provides constant speed, which can make all the difference between ruining your fabric and doing a wonderful, precise, neat piece of work. The USB port is a great advantage since it means you won’t be limited to the number of built-in designs. You can easily download thousands of them for free or purchase them from a number of specialized websites such as iBroidery, Amazing Designs for really cheap (as low as 25¢ per design), or create them in SewArt or Embird software, save them in the .pes and .dst formats, and transfer them to your machine. Prior to this model, Brother used to implement this feature only to their high-end models. Now it’s available for the fraction of those prices. The price/quality ratio is great. Even though it’s definitely not among the cheapest options, its numerous and versatile features make this a great buy considering what you get. The stitch quality and automatic needle threader equal this machine to many high-end solutions, which would require you to shell out over $1000. The LED light lightens up the work area sufficiently, so your work won’t suffer if there isn’t enough light in the room. Free arm option can be used when you remove a portion of the base. It’s a great asset for parts that are hard to access, such as collars, sleeves, cuffs. A bunch of automatic options will reduce your time and effort. Nearly everything happens at the push of a button, which makes the sewing experience seamless. As if automatic needle threader wasn’t helpful enough on its own, the smart screen will even tell you what to do, step by step. The start/stop button and speed controller will eliminate the need to use foot pedal unless you’re used to doing it the old-school way. There’s a lot of built-in embroidery designs, but even that is not the end of your possibilities. Import as many designs and letter fonts as you like via the USB port. There are even built-in Japanese characters, which is a pretty cool option for uniforms and costumes. The machine is quiet enough for any apartment. Your neighbors won’t protest, even if you have the habit of burning the midnight oil. It’s lightweight and portable. Whereas industrial sewing machines boast of stability (due to heaviness) and sturdiness, this little contraption is very handy and you can move it anywhere you like, or even bring it to your sewing classes without breaking a sweat. Some customers report needle breaking. It may have happened due to bad thread tension. The 4 x 4 embroidery hoop isn’t large enough for bulkier projects. Even though this is a combo machine, people who use it mostly for embroidery will find it lacking in some regards, so you’ll need to keep this in mind. The throat space is too small for big or even average quilting projects. It can only handle very small things. If you are a quilter on a regular basis, you will definitely need a bigger machine. There is no presser foot pressure adjustment. It would be really helpful when sewing through multiple layers, so they would move smoothly and the fabrics wouldn’t slip. Walking foot does not come included. If you’ve ever tried working with leather or similar thick fabrics, you will know that handling it without a walking foot is a mission impossible. Leather will stick to an ordinary presser foot. Slippery fabrics will slide, interrupting the smooth feeding of the fabric and making your sewing experience a nightmare. Even though this machine isn’t heavy-duty and therefore won’t do an outstanding job on sewing leather, it could have been equipped with a walking foot to handle thin, slippery materials better. However, it’s not a huge issue. Amazon and other retailers offer plenty of walking foot options at reasonable prices, and most of them are compatible with Brother digital machines. The embroidery stabilizer that comes included in the package is too thick, so you will probably have to acquire another one. Some users report that a coffee filter will work perfectly. Bobbin winding could be easier. One of the selling points is that the machine is user-friendly, so they could have made this better. Just like all other computerized sewing machines, Brother SE600 can sometimes show an error message seemingly out of the blue. It can look pretty intimidating since the machine won’t do anything until you manage to find and fix the issue. Might be that the thread got tangled, or the bobbin is not wound or installed properly. If the problem persists or you just can’t identify it, contact customer service. When all taken into account, Brother SE600 Sewing and Embroidery Machine seems to be a very nice bargain for sewists who would use the embroidering function only occasionally. 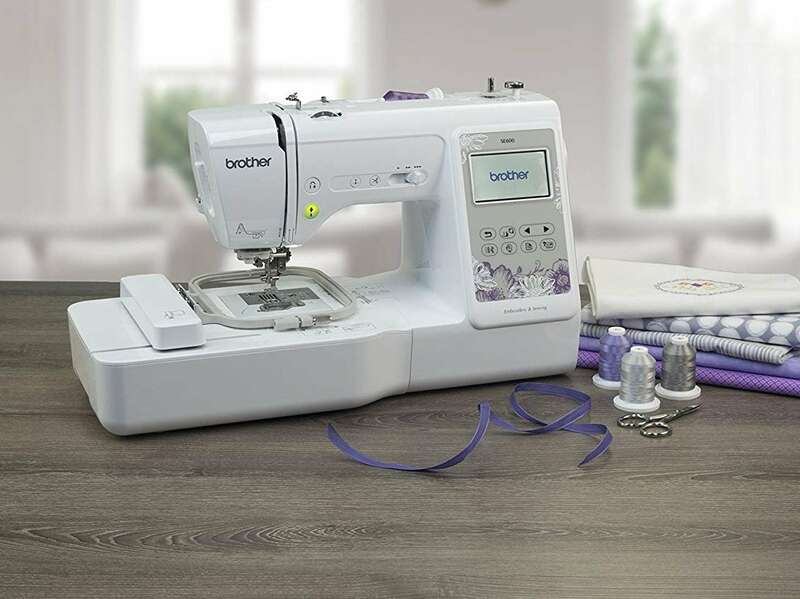 It has a wide array of very convenient functions that will make sewing a breeze even if you’ve never done it before. Even though it’s an entry-level machine, seasoned sewists won’t have much to complain about unless they are boutique owners who have to focus on productivity and efficiency – in which case you will have to ditch this or any other domestic machine and acquire an industrial one. However, if embroidery is your primary occupation, it might be wise to look for a better solution. As I noted above, the working area is very limited and won’t handle bigger projects. Even though with combo machines one function usually works at the expense of another, I think this is the most significant problem in this case. Brother could definitely commit to fixing this issue in the future.